As you probably realise, ladies and gentlemen, that did not happen. In a rather strange twist of events, the soundtrack from From Hell kept playing over and over (and over) again in my head, thus making me pick up that worn copy that usually lies under my coffee mug to keep the stains off the yellow formica. 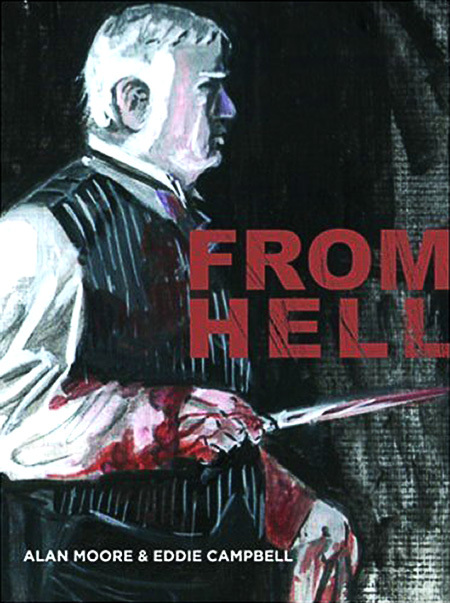 Alan Moore and Eddie Campbell’s From Hell. Time travel: It was 2004, a rather rough patch that perhaps added some colour to my mundane existence. It was then that I chanced upon this worn-out copy of From Hell in some quaint bookstore in Darjeeling. I still remember, I bought it for less than a 100 rupees. I still remember sitting at Keventer’s and drinking a chocolate milkshake, and devouring the book like there was no tomorrow. I still am rather unsure about what makes me love the book so much—the memories attached to it, or the fact that it was perhaps the first revolutionary comic for “adults” that I read. Whatever it might be, that cheap thrill still remains, and returns every time I pick up that tattered book and flip through the pages, mindfully or not. Alan Moore and Eddie Campbell joined forces to create what the graphic-novel-reading world would understand to be the socio-political factors responsible for the birth of the Ripper, grounded in reality and definitive in the progression of events. Comic book literature has never felt more convincing: Surreal commentary that captures the British society of the past and the then-present; the visions of the future as seen by the Ripper; the excruciatingly graphic portrayals of the murders. The black-and-white illustrations mask the presence of blood, adding to the pages an aura so sickly, and a touch that can’t be considered to be anything less than genius. The story told is probably one that many have heard and believed in by now. The existence of a heartless soul, who, in the darkness of the night, spilled the blood of promiscuous young women, drawn into the trade of flesh, in order to protect the royal secret—the birth of a child fathered by the Prince of Wales to a not-so-significant shop-girl. More than just a historical account, the novel attempts to link the murders to the various socio-political elements that plagued London at that time. Themes such as misogyny, the rise and fall of various religious powers, and the development of the science called medicine are all very accurately caught through illustrations in the novel. This work of black-and-white fiction, after a while, ceases to exist as just a story told through the generations—the precise artwork captures the true essence and macabre mood of Victorian London. I’m not sure what is more horrifying: The flawless depiction of the aloof upper classes, who seem to be unaware of the trauma that their not-so-fortunate counterparts go through, or the nauseating pace at which the murders and the crimes take place. As I end this column, I’d like to ask the weak-hearted to stay away. Though on paper and darkly illustrated in black ink, the gore, the horror, and the mind games that make up this seemingly insoluble mystery will rob you of a good night’s sleep. And the shadows… well, a Ripper just might be lurking within! By Bhanuj Kappal · Delhi's Music Basti aims to empower children by giving them a platform to express themselves through music. kapakapi …kono kotha hobena …. excellent…though i haven’t read this comic yet..but after reading this column i would definitely like to grab a copy for my own …..
How oh how did you get it for under a hundred rupees? Jealous!